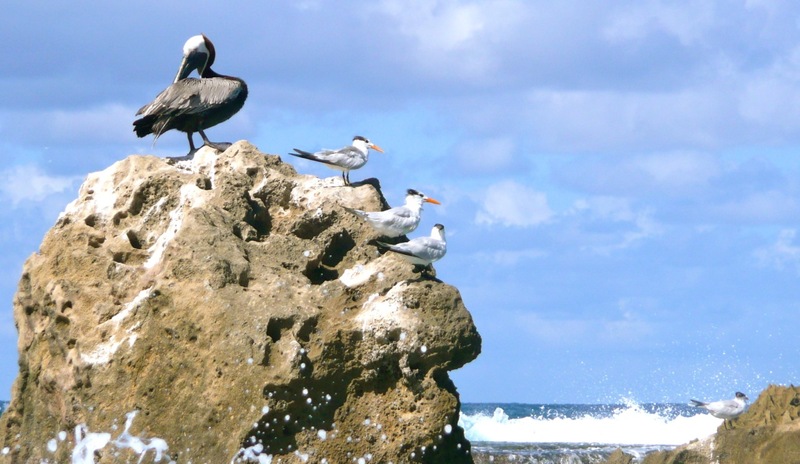 Sitting on a beach chair looking out at the ocean with a sick cousin by my side, I noticed some birds and a pelican on a large rock off in the distance. The rest of the family had decided to go snorkeling but I decided to keep my cousin company. So we sat and chatted. And chatted. And chatted. After awhile, my cousin said to me “Hey, let’s go take a picture of the pelican over there.” I explained to her that I had already taken a picture of it but she was insistent that we get closer. Walking on the sandy beach towards the rock where the birds were sitting, I inhaled the clean ocean air and allowed my eyes to feast on the deep blue hues of the sky and the clear water. Everything was perfect. Following my cousin with the camera in hand, I slowly made my way to the edge of the ocean. I didn’t want to get wet even though I had brought my swimsuit along. 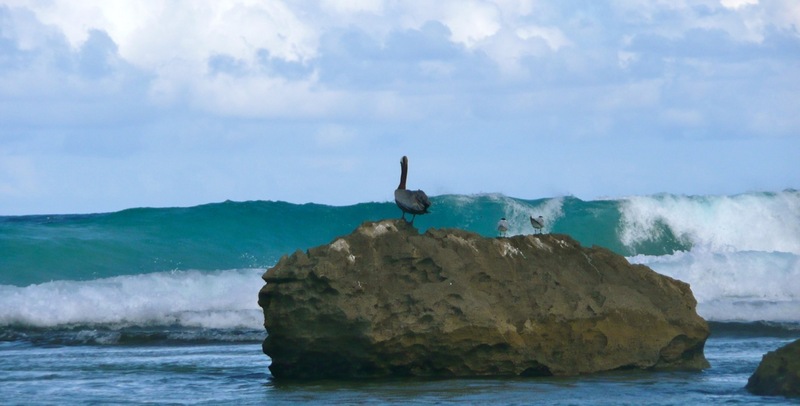 Once we got closer to the pelican, I watched how the waves splashed behind the rocks he was on. It breathtaking! “Try taking a picture from here!” my cousin shouted. Closer and closer I got to this wonderful looking bird who seemed to be posing for a shot. I hadn’t noticed the orange/red coloring on the one bird before. This was exciting! Completely aware of my surroundings, I gingerly stepped a little closer with just my ankles in the water. One more picture, I thought to myself. Not one to miss a good shot, and with the birds cooperating, I waded in a couple more steps. This shot would be perfect, I told myself. And it was! 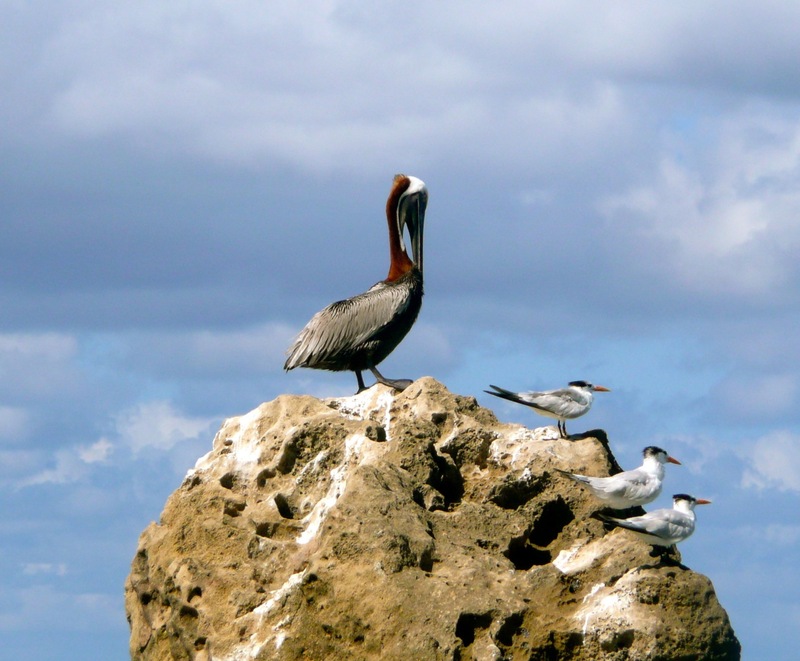 The pelican had bowed its head as if in reverent prayer and the smaller birds gazed straight ahead as if they were posing for me! It was a dream come true! And then it happened. I noticed a huge wave coming towards the rock that the birds were sitting on. Uh oh. That wave was heading our way. I turned around to get back to the sandy beach when suddenly I felt my feet catch on something underneath me. Pain seared through both my feet, the camera flew up in the air and I fell backwards. With hands outstretched to stop my fall, I watched as my camera hit the rock. Then I hit the water. The huge wave splashed over both me and my camera. In the meantime, my cousin was yelling “Norma! Norma!” She was hurriedly trying to get me up before the next wave hit but the pain made it hard for me to get up. Both feet had landed on a jagged rock that was behind me. My camera! My cousin quickly got the camera out of the water. After she helped me get upright, I felt as if water was draining from my foot so I looked down to see what it was I was feeling. The right heel had a large piece of skin protruding from it and blood was gushing out. Limping to the beach, with one arm over my cousin’s shoulder, I knew I was in trouble. I hobbled back to the beach chair as blood continued to flow from my foot. After a few minutes, I knew I had to stop the bleeding so I went over to the edge of the ocean and dunked my foot in it as I had heard that salt is good for healing. Once back on the beach chair, I took a towel and pressed my heel against it. Ouch! My foot was now throbbing. “You can’t do that.” Her response made me want to laugh except for the fact that my head was now starting to spin. “It’s going to happen real soon” I said quietly. Then, she got up, walked to the edge of the ocean and yelled for the rest of the family to come in. When she returned she found a canvas towel holder and gave it to me to blow into but it didn’t have the same effect as a paper bag. As my head spinned, I saw her standing there unable to determine what to do. My oldest son came out of the water first and assessed the situation (he’d had this experience with me before — the fainting) then headed over to a bar area with my husband and younger son in tow. Later he relayed his experience of going up to the bar and asking for “alcohol.” The woman behind the bar said “Yes, we have lots of alcohol. What kind would you like?” (how funny!) Not speaking the language very well he did not know how to ask for alcohol in Spanish. Eventually, with hand motions and a few Spanish words thrown in, the bartender gave him a can that had something in it that clots blood. After purchasing some water, they headed back to where I was. A quick spray with the blood clotter can, a drink of cold water and some sympathy had me feeling much better — hobbling but better. Since the injury was on the bottom of my heal, I had people around me clean and bandage the wound for the remainder of my stay in Puerto Rico. Once back in the U.S., I went to the doctor who told me that we had done everything right as the heel was healing as it was supposed to with a large scab covering the puncture wound. It’s been almost four weeks since my fall in the ocean and the right foot is healing beautifully. Unfortunately, the left foot is now starting to feel sore throughout the day and my left hand (the one that I tried to stop my fall with) is currently in a splint. It felt achy after the fall and as each day passed the pain started getting worse and worse. Friends have told me I might have a hairline fracture and that I should get the hand x-rayed. Searching on the internet for similar injuries, the possibility that I have a hairline fracture is high but the only thing the doctor would do is take an x-ray to confirm it then put me in a splint. I’ve decided to bypass the x-ray, assume it’s a fracture and wear the splint for 4 weeks to see if it heals. Sometimes it doesn’t pay to get closer to beauty.